Having a pet is a wonderful thing, but finding an apartment that is both pet-friendly and offers the living conditions you desire can be challenging. Luckily, Northern Virginia is a thriving area with many apartments to choose from, and even more fortunately, many allow you to live with your pet. When choosing an apartment it’s always a good idea to consider location, space in the apartment, and pet policies. 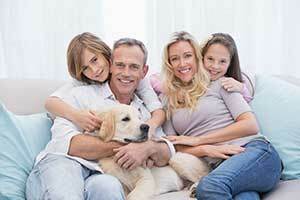 You also need to be sure that the apartment your choosing is ideal for your specific pet. For example, if you are a dog owner, you need to make sure there is plenty of space outside to walk your dog. Depending on the size of your dog, you also need to make sure that the size of the apartment is suitable for them to comfortably live in. These pieces of information can help you and your pet find the right home. Below are some top-rated apartments that are pet-friendly. Ellipse at Fairfax Corner offers you a great location and pet-friendly apartments. This apartment has been renovated to offer beautiful new interiors and resort-style amenities. One of the greatest parts about this apartment is its location in Fairfax Corner. Fairfax Corner has tons of shopping, restaurants, and a movie theater all within walking distance. It’s a lively area that you can explore with your pet! There are also plenty of grassy areas for your pet to enjoy conveniently in the apartment community. They allow both dogs and cats, however, there are some breed restrictions, so reach out to the leasing office for more specific information. They have a two pet restriction and they require an initial fee off $400 for your first pet, and $200 for your second. There also is an additional $50 rent charge per pet each month. Bell Fair Oaks is a modern apartment that you and your pet are sure to love! This apartment has plenty of amenities that are sure to peak your interest, such as a fenced in pet park. This is a great place to let your pet run around and get some fresh air without having to worry about them being on a leash. Many dog owners worry about their dog being cooped up in an apartment, so having access a fenced in pet park is the perfect living solution! Bell Fair oaks accept both cats and dogs. They also accept non-traditional pets to include: turtles, non-poisonous frogs, domestic hamsters, hermit crabs, gerbils, small domesticated birds, and domestic fish. When it comes to dog breeds they do have some restrictions unless the dog is an assistance animal. These include Akita, Alaskan Malamute, American Staffordshire Terrier, Bull Terrier, Chow, Doberman Pinscher, German Shepherd, Great Dane, Husky, Wolf Hybrid, Pitbull, Rottweiler, St. Bernard, and any dogs “mixed” with the above breeds. They also don’t allow snakes, spiders, ferrets, and iguanas due to liability reasons. They allow up to two pets with the max weight of each one being 75 lb. There is a one time fee of $500.00 and an additional $50.00 charge every month. Located in Centreville, Lakeside Apartments is a great location for you and your pet. They have tons of amenities to offer, many of which are outside community-oriented spaces which can be terrific for you and your pet. Some of these include a dog park, picnic area, and grilling area. The dog park is extremely beneficial for walking your dog if you are looking to stay close to home. It is also a great space for your pet to play and relax in without having to travel anywhere. They also have a wide variety of floor plan options for you to choose from. This will allow you the opportunity to select an apartment that has plenty of space for you and your pet. They are pet-friendly apartments, but some breed restrictions do apply. Reach out to their leasing office for specifics about their pet policy. Lakeside Apartments also offers the unique feature of having a lake that you and your pet can enjoy together. Another great pet friendly apartment complex is The Point at Park Station. Located in Manassas Park, it is in a great location if you are looking to become a part of your community. There are many great of bars and restaurants, coffee shops and stores to choose from, as well as some highly ranked schools. Their quality amenities will also allow you to become apart of the apartment community as you explore their gym, clubhouse, and pool. They also offer the unique experience of having a bark station, which your dog is sure to enjoy. The Point at Park Station contains tons of grassy areas that are great for walking your dog. Modera Fairfax Ridge is one of the newer apartments on this list. They have many different floor plan options available, so you can choose one that provides you and your pet the space you desire. Their finishes and designs rival top-of-the-line condos, so you know you can expect a quality place to live. They allow both cats and dogs and have plenty of space outside for them to enjoy. Modera Fairfax Ridge does reserve the right to disallow certain aggressive breeds of dogs and aquariums, so be sure to reach out to them to find out if your pet is allowed. You’ll definitely love the floor plan options that include a den and loft area, as this will give your pet more space to enjoy. When it comes to dogs, many apartment buildings have breed-specific restrictions. Oftentimes their websites can lack the specific breeds, so you’ll have to reach out to them for more information regarding their pet policy. Breeds that are generally restricted are Pitbull Terriers, Staffordshire Terriers, Rottweilers, German Shepherds, Presa Canarios, Chow Chows, Doberman Pinschers, Akitas, Wolf-hybrids, Mastiffs, Cane Corsos, Great Danes, Alaskan Malamutes, and Siberian Huskies. You also have to check if they allow dogs that are a mix breed of any of the ones mentioned above. If you have any unique animals, you will also have to check further into the apartment pet policy, as some places only allow cats and dogs.